Well, I did it! I finished Monika's Sakura Cherry Blossom Shawl last night. I was under a tiny bit of pressure, because I am donating it to our church's silent auction portion of their flea market next Saturday. I sure hope someone will want it. The church really needs the funds right now. Since I don't have the pocketbook for some of the more luxurious yarns like silk, I did happen upon this new yarn by Caron...Simply Soft Shadows. This is an extremely soft DK weight acrylic yarn that is self striping. 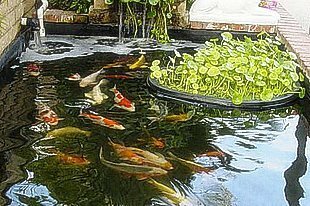 It is very reasonably priced. I used 8 of the 3 oz. skeins. "Mardi Grey". Plus I think the easy care is a bonus. It's machine washable gentle cycle and machine dry low heat. One last thing before I go...I have a new addition to my knitting library. No, it's not a mother's day gift, but I got it yesterday with my 50% off coupon at AC Moore. I could resist the bargain ;) Now, I have lots of new pattern stitches to try out. My Ball Band Mop Cover Pattern has been published! 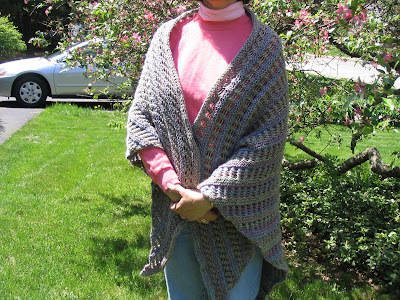 I was very flattered when Sandra wanted to publish my pattern in Fiber Femmes Magazine. Thank you Sandra! the shawl is beautiful and you showing it off in front of that lovely cherry blossem tree makes it look all the more gorgeous! Wow, beautiful shawl! Congratulations on the publication of your excellent pattern! It turned out great! I love it! It sure eats a lot of yarn. I love my Knitting Stitch calendar. It's the first place I look, when searching for a pattern. I hope somebody likes your shawl, it looks very comfortable. Congrats on your publication! happy Mothers Day! 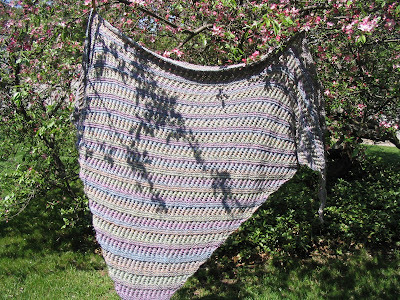 The shawl is beautifulm - I'm sure it will be one of the first things to sell! Glad to hear you had a wonderful day! Sounds like you had a nice mother's day. Your son's intership sounds really interesting!! I have been so tempted to get that book! Coupons are great - aren't they? How exciting for you to be published! That is a great pattern. I need to try that very soon. Happy Mother's Day to you. 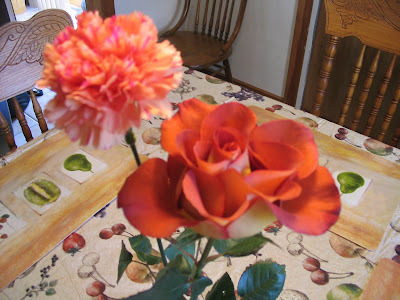 I know that I will be thinking of my mom today... well I do every day. Wishing she was here. Beautiful shawl! Sounds like you had a very nice Mother's Day. Congrats on being published! Oh pretty shawl. 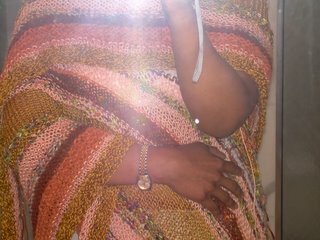 I am positive someone will be glad to take your shawl home! Wow, your shawl is so beautiful. Congrats on the publication of your pattern. That has got to be really exciting. Congrats on the publication. And you shawl is lovely, I am sure it will be a hit. 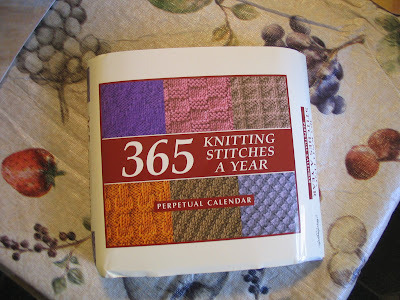 I have that knitting stitch calendar, I love it and use it often. The shawl is beautiful!! Very fitting for you who loves all things Japanese :-) Glad you had a wonderful Mother's Day!! Congratulations on your publication!! Congrats on being published! Your knitting is always so beautiful, you should be published! And now, as a little gift, I tag you! ;) Check my blog. The recipient will be very lucky to have such a gorgeous shawl! Very nice. Thanks for sharing your mop cover pattern. I especially like the orange and yellow one. I really like the shawl and the color is so neat! You've been tagged. Go to my blog ( http://joseesimard.blogspot.com ) to see the rules. Gorgeous shawl! Congrats on your pattern publishing!